‘Judge me in May’, Arsene used to say, and for many, many years those who had clamoured to dismiss him after a couple of poor games had to eat some kind of pie come the end of the season – though with the rise of social media and YouTube celebdom that pie was increasingly less humble. Not much of the Uriah Heep about the modern fan, to be honest. But as time went by the teeth got sharper, the barbs deeper (and maybe the competition a little steeper too) and suddenly it was no longer possible for him to deliver his much derided (though seemingly much prized these days) top four finish. Two years in a row saw the team falter in the second half of the season, and eventually the Arsenal powers that be saw fit to draw a line under a managerial career of much dignity and success. Those who had campaigned viciously for his removal crowed in triumph, those who had loyally supported perhaps felt relieved that at last it was all over – though I suspect most fans found it hard when it was finally time to say goodbye. I certainly did. But I got over myself in time, realised no one had actually died, and as is the way of things found myself beginning to wonder who the new man in the dugout might be. I knew little of Unai Emery, so his appointment underwhelmed me to begin with, but as the long weeks of summer crept by, I began to warm to him – despite not being that convinced initially by the new signings that were made. Pre-season seemed to go well enough, and to be honest I wasn’t expecting much from the first two games against City and Chelsea. Two losses as I felt would be the case, but not nearly as bad as I feared, and the spirited fight back at the Bridge suggested things might yet turn out well. Nevertheless, the next game, at home to West Ham, began to take on real significance. I was lucky to see the game live, and the first thing I noticed was a very different warm-up to previous seasons, with time spent on sweeping moves and players moving to convert crosses from both flanks. But as we wobbled and then went one down, the prospect of three losses and all that that would entail began to emerge. Be careful what you wish for and all that, but fortunately our very own Nacho Man (surely one of one of Arsene’s cannier purchases) hadn’t read that script and was there at the far post to steady the ship and set in motion a sequence of results that were certainly beyond my wildest imaginings. A fourteen-match unbeaten run no less, with notable wins, progression in both League and cups and lately a fine home draw against a potent Liverpool side who many had predicted would find us easy meat and ripe for the taking. What, as the saying goes, is not to like? Well … one or two things, I think – and in particular the shoehorning of evidence to try to fit a narrative. The old Wenger knows best, Wenger out divisions are still there, and this seems silly to me, but I suppose the wounds of Civil War take more than a while to heal. Suddenly some are suggesting that the fantastic run we are currently on is all down to Emery: the coaching is better, the signings more astute, the players happier, the spine stronger, the character more robust, the years of failure at long last over. Oh brave new world, we’ve got our Arsenal back! Meanwhile others point to similar runs of success in the quite recent past, to the impressive signings made in the last months of Arsene’s stewardship, to the investments made in coaching and fitness and medical centres, to the careful way the whole succession was orchestrated and managed. And also to the slices of fortune enjoyed on the pitch, to the gilt edged chances offered up to profligate opponents, to the sense that whatever else is going on, cracks are only being papered over. What is most wonderful of course is the sudden reversal of position. Now it is the Emery enthusiasts who are seen as delusional, the old AKBs as the sober realists. Lord what fools these mortals be. And where lies the truth in all of this? Somewhere near the middle I suspect. Arsene et all had probably been planning for his departure for a couple of years, and the players must have sensed that he wasn’t going to be around forever. I guess that that as much as anything stopped them giving their all when the football was suddenly difficult, when they didn’t really fancy the away trips. At the same time they were still capable of turning on the style for him when it was easy enough to do so. I am quite sure that they have been inspired by a desire to impress the new man and have probably found it easy to buy into whatever new methods and tactics are being employed (which I guess are pretty similar to most of what went on before). And I think too they will have enjoyed the growing chorus of approval from press and pundits (which in turn spreads quickly to the fanbase) and are starting to feel more valued and special. It interests me that now Kroenke has sole ownership the club’s PR seems ever more positive. And on that note it is surely ridiculous to try to pretend that Arsene Wenger was hopeless in the last few years, or to try to airbrush the three FA Cups in four years out of History – just as it is equally ridiculous to suggest that Unai Emery’s pretty brilliant start has got nothing to do with his footballing knowledge and his outstanding motivational powers. I would like to think that it is now time to be proud of both past and present – and to let them unite in healthy anticipation for the future. I went to see the home game against Leicester, and was expecting a sparse enough crowd given the game was on a Monday and on television. Far from it: the ground was packed, and the second half display lifted the roof. Even allowing for the normal buzz that surrounds an emphatic win something felt different queuing for the Tube after the game: a collective excited happiness and identity was in the air. I expect it must have felt like that after Lacazette’s imperious finish last Saturday – and I hope that won’t be lost should results start to go a little bit awry as the winter fixtures bite. We have a couple of games to negotiate later this week – and then a bit of a break in which to recharge batteries and take stock again. I am looking forward to it all, and hope that come May the judgment will be a positive one: if my reading of the signs are correct it could indeed be so. Thank god I won’t have to watch so called ‘Sporting’ Lisbon again. No wonder their fans attacked them. a sub par performance, where our lack of composure and quality in the final third let us down, always seemed rushed, and too individual. Can’t really recall their keeper having much to do despite all our very good attacking positions. For me Ramsey and Mkhitaryan, and to an extent Aubameyang real let downs tonight. we are qualified for knock out rounds now, but still need a win from one of our two remaining games to be sure of topping the group. big downer is the sad injury to Danny Welbeck, looks a real bad ankle injury. Not a great performance, a very costly game, but a mitigating factor, as yet again our players witness a very nasty looking injury, even if this one was more accidental than others past. Guendouzi and Ramsey were a fine midfield pairing for a match such as this, but we could make very little work further forward. The attacking midfielders didn’t use the space very well; crosses weren’t a good ploy against their large center backs; lacked the creativity to unlock their massed defense. One of those nights. Second that. Based solely on their football conduct, on and off the field, I am dangerously close to having an implacable dislike of the Portuguese. If their football character reflects their character…yikes. They obviously start young out there as I’ve often seen their youth teams look like veterans of all the dark arts. If you can include grudging respect to those arts within ultra defensive play,though, you’d have to say they are experts at it. Shame Mathieu didn’t leave pitch earlier as he was very influential and showed why he had good years at Sevilla and Barca. A downer anyway, as Eduardo said. Nothing could make it a good night after what happened to Danny, and then frustration in addition to that. Thanks Tim. The big challenge for the new gaffer in his first season here will in my opinion be the upcoming Xmas crunch. Good luck to him! The straight talking manager who set his team to play as he intended in pre-season (we recorded that our Experts were too busy admiring their reflections and not paying attention to the Football, again…) finally went for the Ramsey in CM option tonight. Sorry to disagree Eds, hehe, but Rambo was without question the best footballer on the park this evening. No need for any debate. Question is, when will we see the best Brotish CM play in CM again? Or just on the right in what I am yet again (sorry!) going to call the Napoli formation? Hopefully before he changes agent and signs up on the 1st February 2019. Get well soon Danny Welbeck. Terrible and in this instance unfortunate and unlucky injury for an athlete. Unai Emery was understandably in reflective mood after our draw with Sporting CP on Thursday night as he discussed the game and Danny Welbeck’s injury. When one player has an injury like that, every player on the pitch they look at this injury. First it’s in your mind – you think for the player. But I think the players were concentrated on the match and we forgot this injury the next minute on the pitch. But when the match finishes, the first thing they did was ask for him. Sporting are a very big competitive team, and organised. We spoke before and at half-time. Every Portuguese team is very competitive and today their commitment in the defensive moments was big. We needed to be calm and to create chances to score, but it’s not easy on the pitch to make clear chances against them. I think this is the summary of the 90 minutes. It was difficult to create big chances against them. We created but it wasn’t enough to win tonight. I think it’s the merit of them. They are a very competitive team, organised, and they worked very well. I’m happy for us also, because very player worked well with very good commitment. But it was a difficult game. We remember the match in Lisbon, it was also difficult. We won that and now we can say those three points away were very important for us. This point today isn’t enough for us but at the moment we are on target to be first in the group. We are first at the moment and we are going to continue on our way for that. Our mind is to be first in the group. Then every match we want the best performance from every player. We want to use the players that we think [are right] for each match, and think about the next one. After this match, we think about Sunday’s game against Wolverhampton here, and continue to create our ideas. This match gave us a lot of information for continuing collectively and individually. Some players need to take responsibility and confidence. I think there were a lot of positives tonight. The Lichtsteiner injury changed our idea in the match. We wanted to bring on Eddie Nketiah and give him a chance. When Lichtsteiner had this injury, we had to play with a right back. For this reason, we played Ainsley, but for us it’s good for Ainsley to play these minutes because he needs that to take the confidence and our rhythm. We changed our idea tactically for the last 25 minutes [due to] the injury. It was just one of those nights when things weren’t clicking. We could have played all night but never looked like scoring. Sporting were well organised defensively and when that wasn’t enough they were perfectly prepared to foul at every opportunity. The ref did not clamp down on some of their behaviour early enough to discourage them. So we have to make do with a point – it’s better than nothing and keeps us well positioned for finishing top of the group. Sadly, I see the old AFC injury curse is starting to kick in. Really sorry to see Danny go off with such a bad injury, seemingly out of nothing – it was hard to see at the ground what happened beforehand. 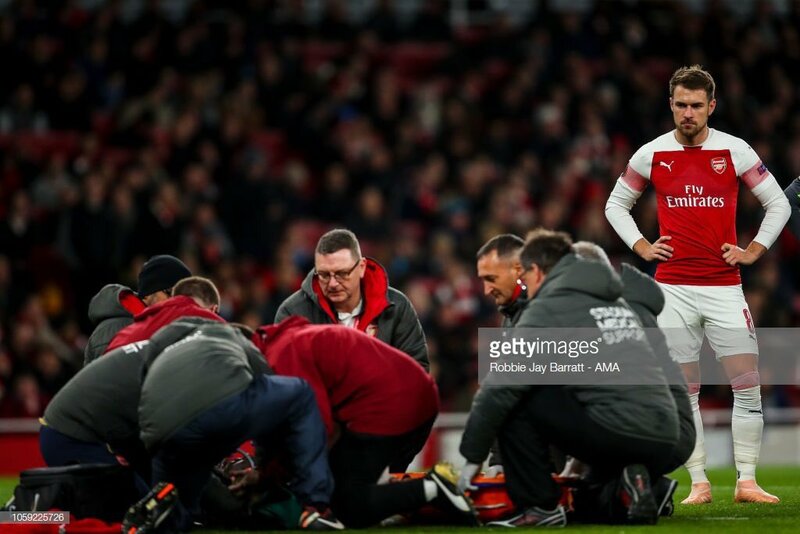 I also felt for poor Eddie Nketiah – he was all set to come on when Lichtsteiner pulled up with an injury. Losing two players to injury in one game could be costly going forward. oddly enough passenal with AMN and Jenkinson now fit I don’t see Lichtsteiner’s injury as that big a blow, with Monreal now back in training and Kolasinac also fit our full backs are covered, Koscielny is in full training a few weeks now, so might not be far from a return, Mavropanos is due back this month too, but he like Kos will need a few U23 games to get match fit.